Video arcades may not be as popular as they once were, but the arcade vibes are alive and well in Arcade1Up's collection of retro gaming cabinets. Every gamer that grew up during the arcade heyday wants their own arcade cabinet. They're nostalgic, they're fun, and they just feel good to be around. Unfortunately, they're also tremendously expensive to track down and somewhat difficult to maintain. However, none of those problems are a concern with the latest arcade cabinets from Atari and Arcade1Up. 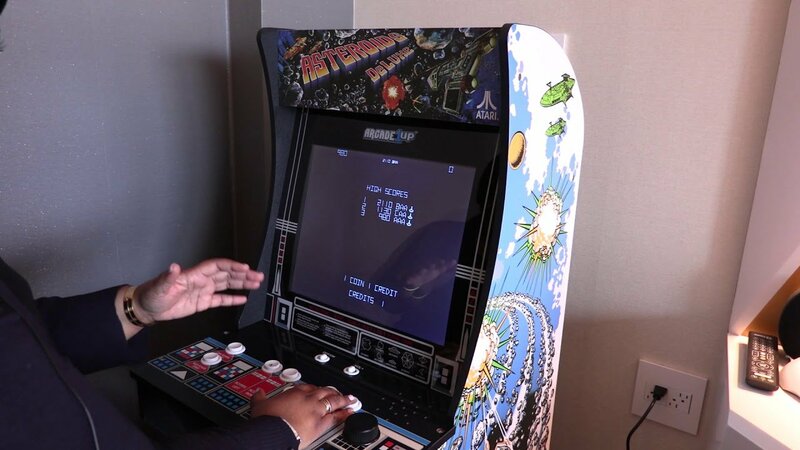 Shacknews was recently able to meet up with Atari's Casandra Brown at GDC 2019 to learn more about the Arcade1Up cabinets and get a closer look at the modern features and retro games each Replicade cabinet offers. According to Brown, Atari and Arcade1Up have three separate arcade cabinets for sale: An Asteroids cabinet, an Asteroids Deluxe cabinet, and a Centipede cabinet, the latter two being showcased in the video embed above. Despite their names, the cabinets offer more than single games: Depending on which retailers they're purchased from, the Replicade cabinets offer between six and twelve games. The cabinets themselves have been designed to be as true-to-form as possible. In fact, the games offered in each are based around the inputs and buttons offered by that specific cabinet, so players won't have to work around their muscle memory in order to get right back into the arcade groove. The full range of Arcade1Up cabinets can be found at major retailers like Best Buy, Costco, Walmart, and others. Many retailers also have demo units on display, in case potential buyers want to get a feel for the games and controls before making a purchase. For more developer interviews and games industry convention highlights, check out all of the great videos featured on both the GamerHubTV and Shacknews pages over on YouTube. None of the Replicades are multi-game. They are dedicated single game 1/6th scale cabinets. Also, the Replicades are definitely not $179.99. They retail for $159.99. That rep really needs to do some homework. On the Arcade1Up front, there are actually four Atari offerings: Asteroids, Centipede, Asteroids Deluxe 6-in-1, and Centipede 12-in-1. The 6-in-1 is pretty much impossible to find at the moment as it was a Costco exclusive that Costco sent back to Arcade1Up (my son got one in a giveaway last year). Stools are not yet available on the market, though the 6-in-1 did come with one in the box. And the risers have been on the market since day one.